Dan Servodidio offers up his best bets for Sunday's action in the NCAA Men's College Basketball Tournament. Wow! That’s all we can say after yesterday’s Elite Eight games - both which came down to the final minutes. Unfortunately we missed on both our “Best Bets” on Saturday, but we can win it all back with two more matchups on Sunday before the Final Four is set! Over the first seven days of the Big Dance, we are now 9-5 with our highlighted suggestions - including notable first-round calls of Yale (+7 over Yale), Murray State (+3.5 over Marquette) and UC Irvine (+4.5 over Kansas State). Each day during the tourney, we highlight a couple games as the “Best Bets” with interesting point spreads and over/under’s that we can take advantage of. The lines are all the current ones according to the Bovada Sportsbook. Obviously the loss of Chuma Okeke hurts Auburn, but the Tigers showed us they have capable players who can step up and in his absence. The Midwest’s 5-seed played the final 8+ minutes of Friday’s win over top-seeded North Carolina without their star forward - and still won by 17 points. If Okeke was healthy, Auburn is likely favored in this game, but a 5-point line in Kentucky’s favor seems way too high considering what we just witnessed two days ago. Auburn has a few forwards that stepped up to the plate on Friday and showed us they can compete with the best. Danjel Purifoy, Horace Spencer and Austin Wiley can all provide enough for Auburn to survive in the paint against Kentucky’s talented bigs (PJ Washington and Reid Travis). Many people may look at how Auburn has fared in its two previous matchups against UK this season - which have not been good. The Wildcats won by two on the road in January, then followed that up with a 27-point drubbing at home in February. Yet, Auburn is a different team this time around. They have won 11 straight games including an SEC tournament crown, two wins over Tennessee and Friday’s victory over UNC. Kentucky may win this game, but five points seems like too much leeway for the Okeke injury. We got burned yesterday when both Elite Eight games went over, so let’s go in that direction today with the later matchup. Duke, playing at the 19th-fastest tempo in the nation, tends to force opposing teams to match their speed on offense to have any chance at winning. Virginia Tech, one of the slowest teams in the country, did that on Friday and had to score 73 points to make it close. Last weekend, we saw UCF play up to Duke’s pace and score 76 points despite also being one of the 50 slowest teams in college basketball. 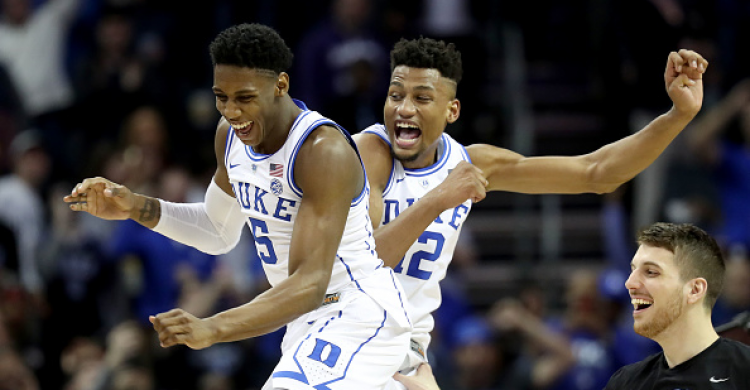 Now the Blue Devils get Michigan State, who are middle-of-the-pack in terms of tempo but has scored at least 70 points in all three tournament games - including 80 in Friday’s win over LSU. KenPom predicts this game to have 153 total points in a one-point Duke victory - and we see it similarly. The Spartans could pull out the upset - and it could come in overtime - but either way, they’ll need to match Duke’s up-and-down tempo on offense to even have a chance at moving on to the Final Four.